Although pretty much every sport is designed to inflict some sort of pain and humiliation upon the losing side, none has set out so blatantly to do so, until now. Boxing or UFC are perhaps the closest sports to just going hell for leather against your opponent. But they’re sports, the people who compete in them are athletes, there’s skill and technique involved. While there may be some semblance of technique here, I’m not sure the people taking part are athletes? I’m pretty sure they’re just folk who like hitting people, or like getting hit, or both? Either way, these bizarre ‘slapping competitions’ are brutal. And before you ask, no it’s not the same as ‘slaps’, which everyone played at school, it’s much, much worse. 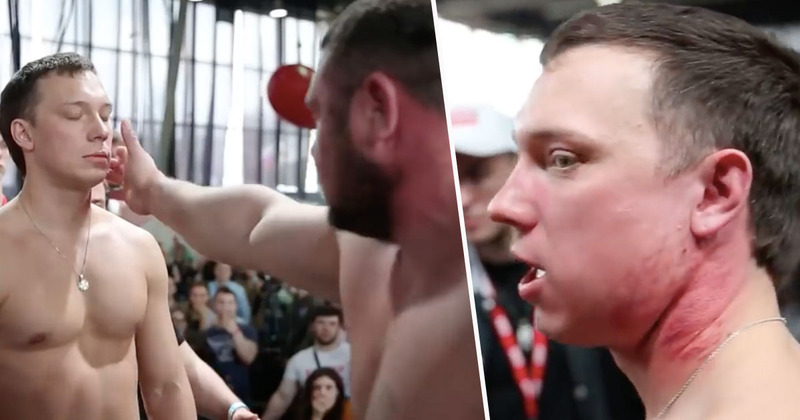 These crazy competitions have been happening in and around Moscow, Russia mainly, and, as you can see, involve grown men slapping the sh*t out of each other. The most recent competition took place in April this year at the Sarychev Power Expo, which aims to promote power sports, patriotism and the strongest men in Russia, according to The Sun. Because nothing says patriotism more than a slap in the face. The event is organised as an elimination-style competition, where two men face-off against each other. The slaps just keep on coming until one man surrenders. I can’t wait to see this in the olympics. After hours of subjecting himself to many, many slaps, Yuriy Kuzmin from Nizhny Novgorod, was eventually declared the overall winner. The biggest slapper? Yeah, go on then. He took home the prize of 25,000 Rubles – the equivalent of £296.50. It seems the sport of slapping has some way to go before it’s making the kind of money other professional sports stars make, as another successful slapper, this time in America, took home $200 after winning a competitive slap-off. The competition was held at the Inkmasters Tradeshow where brave bare-chested men stepped up to the strange challenge of slapping one another in the face in the name of sport. I’m not exactly sure what the rules of a slap contest entail, but I imagine it’s up to the person being slapped to see how long they can take the repeated pain for, while at the same time trying to out-slap their opponent. The video of the championship game began with the announcer telling the two contestants ‘I want you to keep it friendly’, and proceeded to tell the crowd ‘the louder you are the harder they smack, let’s hear it!’ Which is great compering if you ask me. While relatively civilised sports like football and cricket decide who goes first with the flip of a coin, the slap-off was decided by rock-paper-scissors – itself a fiercely competitive game which has probably resulted in its fair share of slaps too. Again, nothing says patriotism like a good ol’ slap in the face.